Boulitte sphygmograph no.11867 with leather arm-strap, in case, by Verdin and Boulitte, 7 rue Linne, Paris, France, 1880-1930. Dudgeon sphygmograph, by Millikin and Down, 3 St. Thomas's Street, London, SE, England. Dudgeon sphygmograph, by Millikin and Down, 3 St.
Dudgeon sphygmograph by Millikin and Down, 3 St. Thomas' Street, London, England, 1876-1890. Case for Marey sphygmograph, Mahomed's modification. 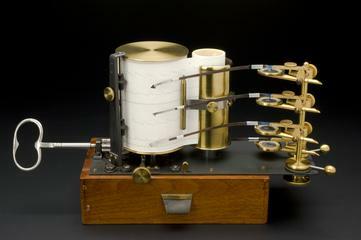 Marey sphygmograph, Mahomed's modification, in case, by J. Weiss and Son, 62 Strand, London, England, 1875-1885.